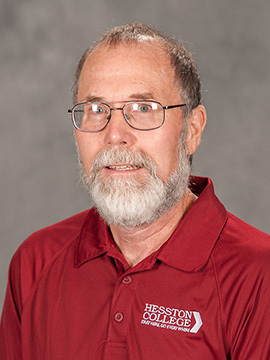 "I teach at Hesston College because I enjoy learning...learning about my students, learning new material, and learning new or better ways to teach. When I hear from you again later in life, I know why I’m still here." What draws you to the field of computers? I’ve always enjoyed computers. My first computer program was punched on paper tape and it went from there. I enjoy the fact that computers always do what you tell them to do even if you don’t always know what that was! The teaching “moment” for me comes when I get a particularly difficult concept or idea across to the student. The challenge is to have multiple ways to accomplish that goal and to know when to use each one. My favorite courses to teach in the computer area are the “hands-on” courses. Since students seem to learn best in a hands-on environment, all my computer courses are now taught this way. Computer Programming I is particularly fun to teach using a graphical animation programming language called “Alice” to introduce programming concepts, then manipulating pictures and other media to introduce Java. I started teaching Aviation at Hesston College in 1978, and especially enjoy teaching Private Pilot Ground School (Introduction to Aviation). It’s fun introducing both Aviation and Air Traffic Control students to an exciting career in aviation. Ever since I can remember, I’ve enjoyed learning new things and then tried to share that knowledge and exitement with others. When I learned to fly, it wasn’t long before I was “instructing” others I took up for rides. Then I made it official by getting my Flight Instructor certificate, eventually moving to Kansas to teach at Hesston College. My original training was in Computer Science, so it was fun to start that program as well as the Computer Information Technology program here. Along the way, I’ve had lots of instructors. Besides trying to learn, I particularly paid attention to how they taught, noticing techniques that worked and some that didn’t. Many of these techniques came to be part of me as well, and I’ve seen the same happen to some of my students. How will Hesston’s computer and aviation programs challenge students academically? In the computer field, one of the biggest challenges is simply keeping up with new technology and skills. The field changes so rapidly that students need to learn not only knowledge and skills, but also need to learn how to learn on their own. Aviation is changing rapidly as well. Learning to be a “lifetime learner” has many rewards in any discipline. What are the advantages students in computers and aviation find coming to Hesston? One of the biggest advantages we have in Computer Information Technology is being in charge of our own lab. We have our own servers, access to the latest operating systems, and the ability to utilize the lab in a “real-world” environment. Since Hesston College is a member of the Microsoft Developer Network Academic Alliance, students are also able to obtain their own copies of the latest Microsoft operating systems and development tools. What do you most want to know about prospective students? My first computer-related question to prospective students is always “What kinds of things have you done with computers?” Some prospective students already have a wide range of computer experience. Others have had little experience beyond Internet or gaming, but are very interested in the field. The answer to this question helps us to explore specific areas of interest or leads us into a discussion of the options available in the computer technology field. How do students and faculty in these programs connect beyond/outside the classroom? I enjoy working with the Hesston College Amateur Radio club. Each year, we put together a team to compete nationally against other schools. I “recruit” heavily from students in the computer and aviation fields. We use the CIT computer lab to train, and the training has paid off with a number of first place finishes. What do high school students need to know about Hesston’s learning environment? With smaller class sizes, hands-on training, instructors who have the time to help individual students, and free tutoring, Hesston College is definitely the place to learn.